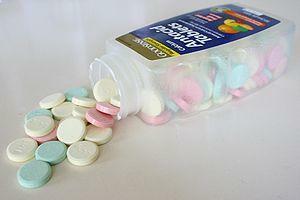 Antacids are very commonly used medications and every person suffering from heartburn will tell you so. These drugs may also be recommended for someone experiencing acidity or acid reflux, because antacids work well and fairly quick for these problems too. According to the substance present in the drug, antacids are classified as: magnesium, calcium or sodium antacids. Antacid medications are either bases or basic salts and they are useful to regain proper pH balance in the body. Acidity or heartburn occur in cases where there is too much acid in the body. Antacids balance pH level and the patient instantly feels much better. In acid reflux disease antacids cover the esophagus and protect it from stomach acid, relieving discomfort and pain. However, what you should know is that these drugs work only temporary. You can’t use them for a long time, since they are not efficient for that treatment. Most of antacid drugs are sold over the counter (OTC) and as such, these products are not strong enough to be used as treatment for some chronic problems with acidity. For short term use and as temporary relief antacids are proven to be safe, but doctors agree that it might not be a good idea to use these drugs every day. These drugs usually don’t cause adverse effects if taken for a short period of time. Some people may experience headaches, upset stomach or diarrhea and these unwanted effects are more common in patients using antacids in higher doses and for a long period of time. Extremely high doses of antacids may affect the bones and cause their weakening, if taken for a long time. Be aware that antacids may interfere with some other medications and supplements. Because of that, consult your doctor prior to start of the treatment. Both children and adults may use these medications, but always make sure about the correct dose in order to avoid any possible problems. Pregnant women suffering from excess acid may also use these medications in limited amounts. Just to be on the safe side, make sure to consult your doctor if you are pregnant and want to use some of antacid drugs. There are many antacids you can find on the market, including brand names such as: Alamag, AlternaGEL, Bell-Ans, Bismarex, Caltrate 600 and Citrocarbonate. Additionally, in your pharmacy you could also seek for: Dialume, Di-Gel, Equate, Equilet, Gaviscon, Iosopan, or some of these drugs: Maalox, Mylanta, Picot, Prepcid AC, Relief, Rulox, Titralac or Zantac. Some natural substances are also known to relieve acid problems, especially some cool milk, yogurt, coconut water and bananas. The disease is associated with certain complications which generally develop when the disease reaches advanced stages. They include progressive cirrhosis accompanied by liver failure, bleeding, damage to the brain in a form of encephalopathy, fluid/electrolyte imbalance, malapsorption/malnutrition, kidney failure and osteomalacia.